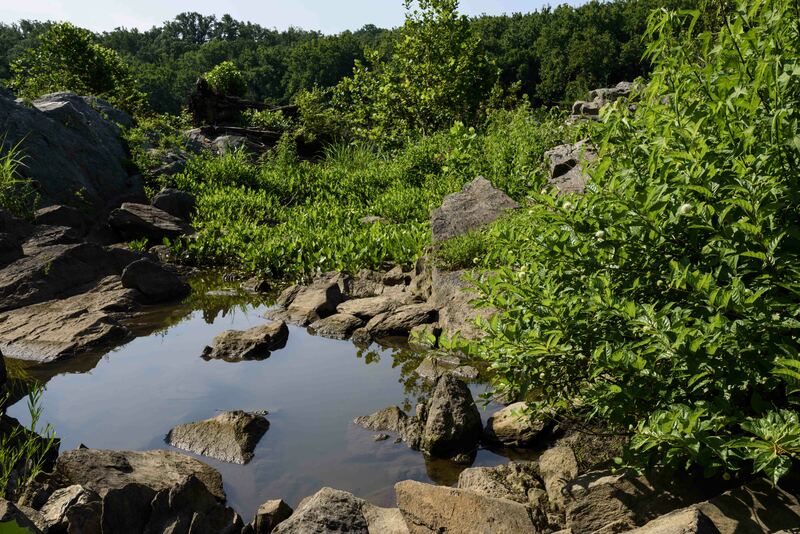 There’s something refreshing about seeing all these green, grassy-looking plants growing right in the Potomac River every summer. 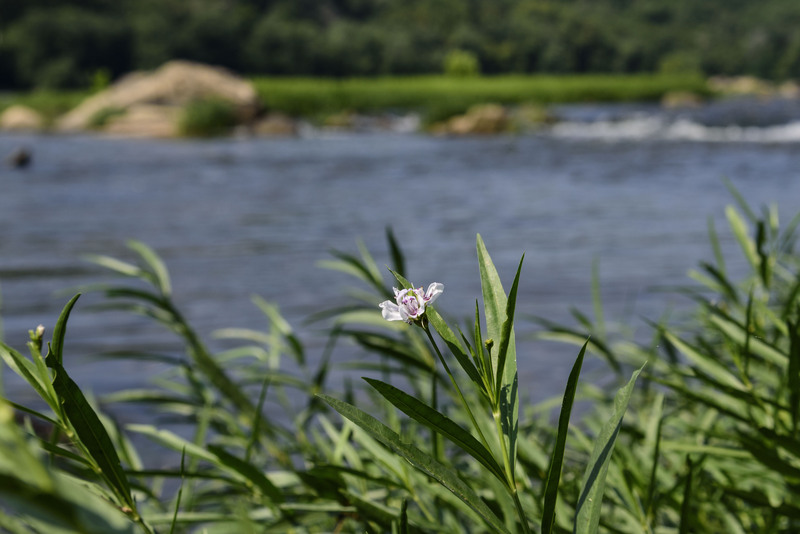 They aren’t grasses, though; they’re water willow (Justicia americana; Acanthaceae), an emergent aquatic whose rhizomes form vast stands of plants in the shallow waters of ponds and streams. 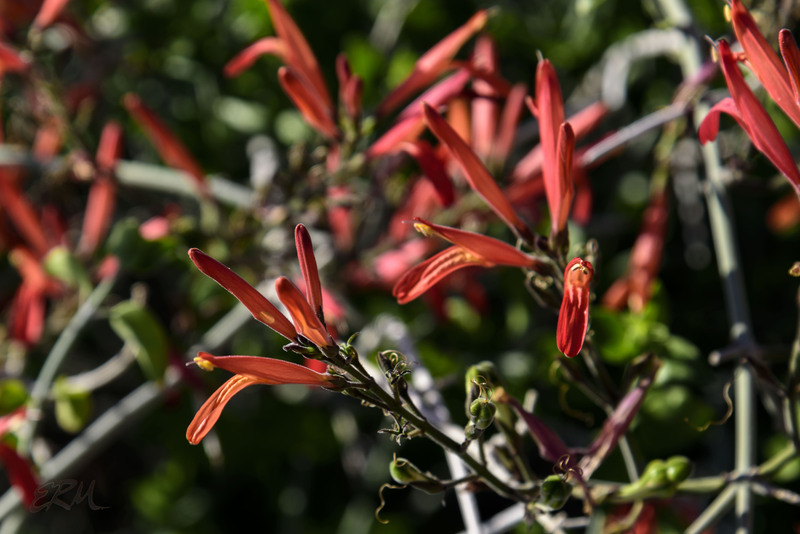 The plants will grow to as much as three feet tall, sending up long stems with tight clusters of flowers on the ends. Only a few stems at a time will bear flowers, but the blooming period of a colony can last two months or more. 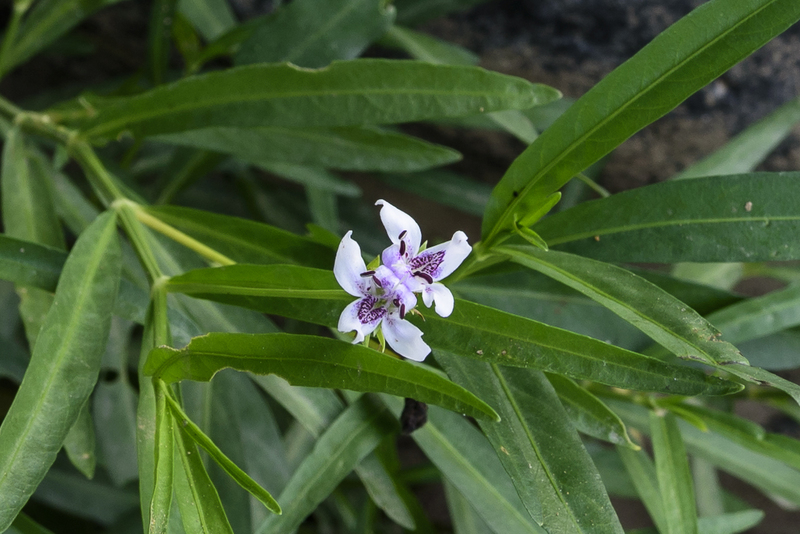 Water willow is native to eastern North America, ranging from Texas and the eastern Great Plains northeastward to New York, Ontario, and Quebec. 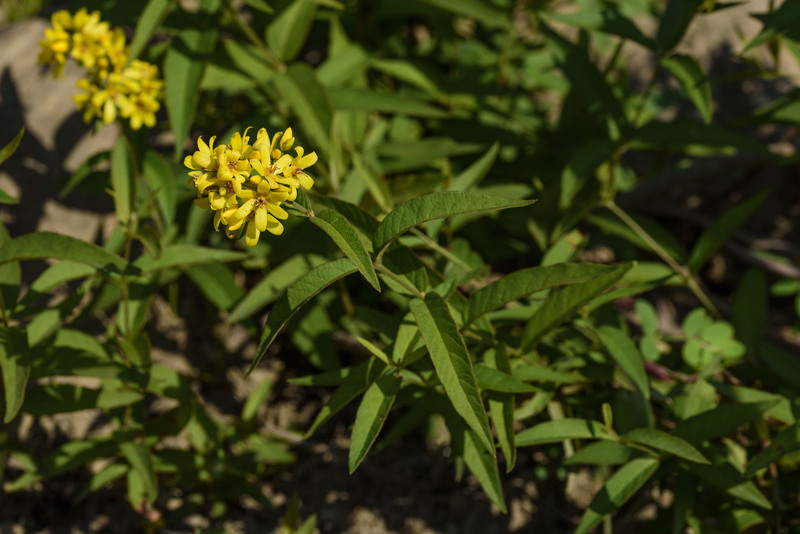 It’s endangered in Iowa and threatened in Michigan. Of the roughly dozen and a half species of Justicia found in North America, this one is by far the most northern species. One other occurs in the southern part of the Mid-Atlantic, and one in the Mid-West; the rest seem to be found only in Florida, Texas, or the Southwest. 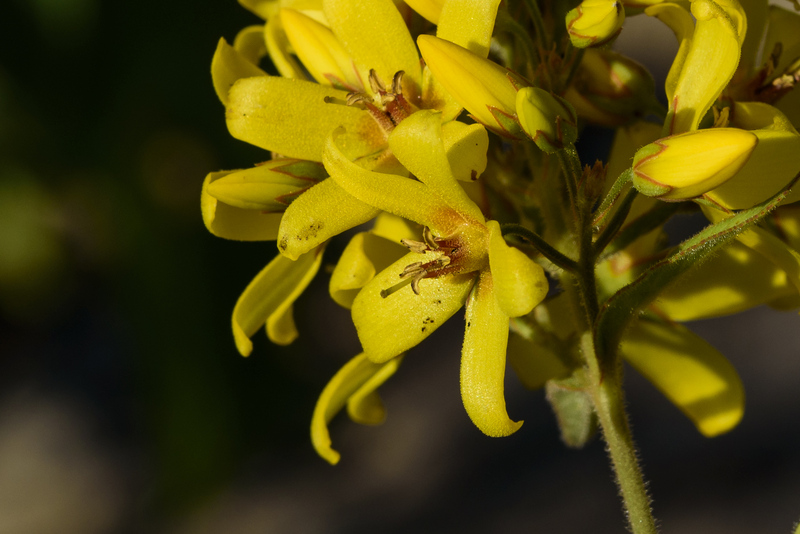 Last spring I found the closely related Justicia californica in Anza-Borrego Desert State Park; it grows as a shrub or tree in the Sonoran and Mojave Deserts. Hard to believe they’re in the same genus. 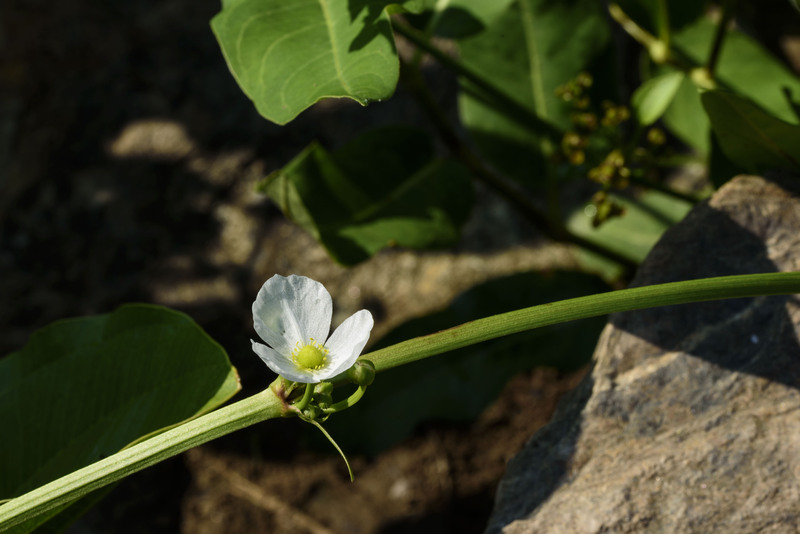 The bedrock terrace I’ve been writing about supports a surprising number of wetland plants. 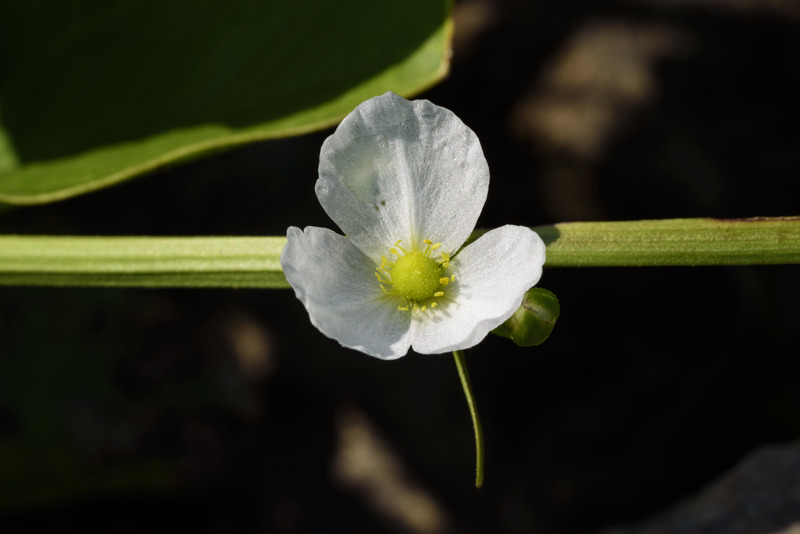 This one, Sagittaria latifolia, is not only a wetland obligate, it’s an emergent: an aquatic plant that roots in shallow water and produces stems, leaves, and flowers above water level. 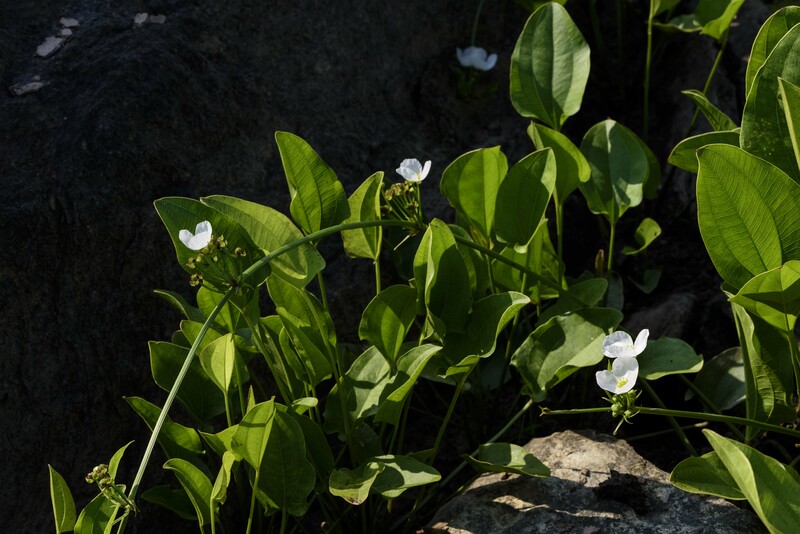 Typical of monocots, S. latifolia has floral parts in multiples of three, with three sepals and three petals. 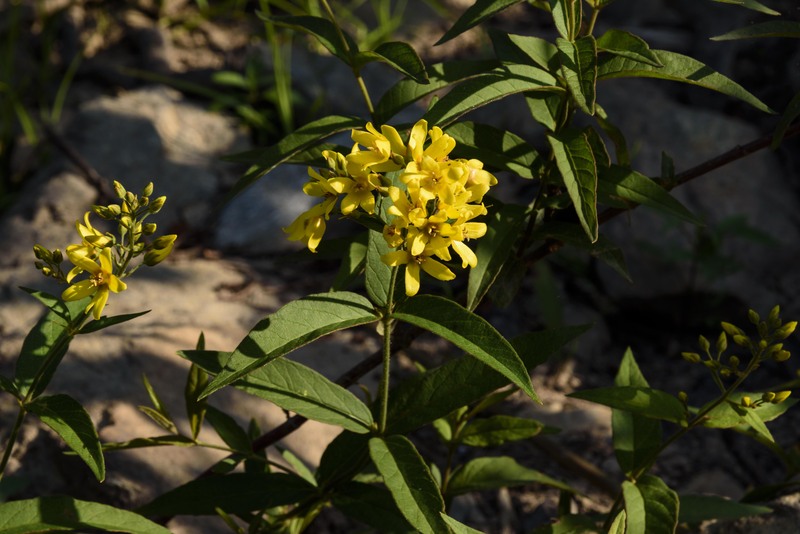 The flowers are typically unisexual, the male flowers having numerous yellow-anthered stamens, the females having numerous green pistils. 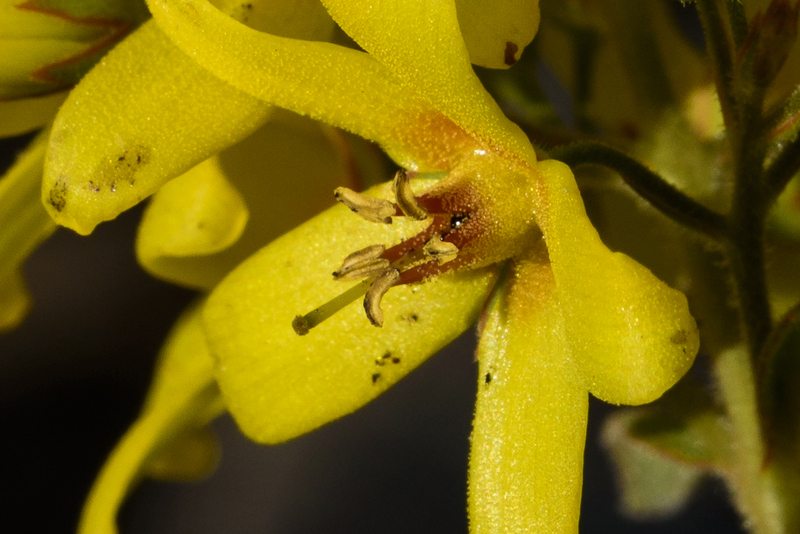 In bisexual flowers, the stamens ring the pistils, as shown here. 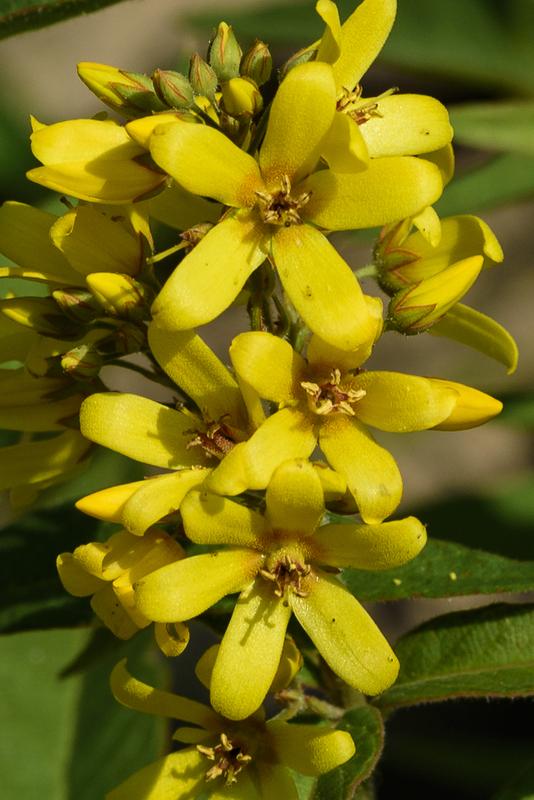 The flowers are usually borne on racemes, sometimes on panicles, with flowers in whorls. 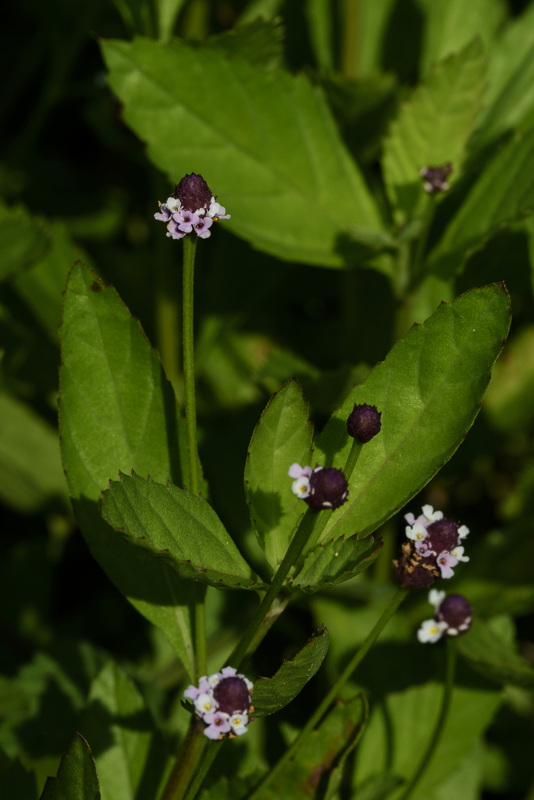 Although S. latifolia is found in every state in the union except Nevada and Alaska, and in much of southern Canada, it’s most common in New England, the Mid-Atlantic, and the Upper Midwest. (It’s also in Hawaii, but considered alien there.) 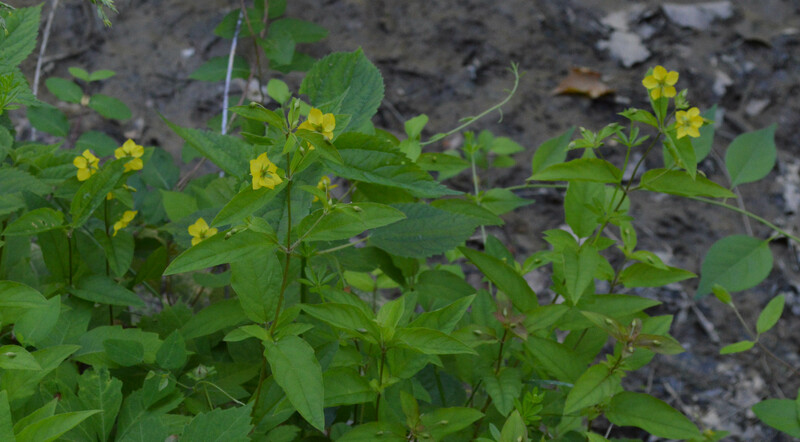 It’s endangered in Illinois, but considered weedy by the Southern Weed Science Society. 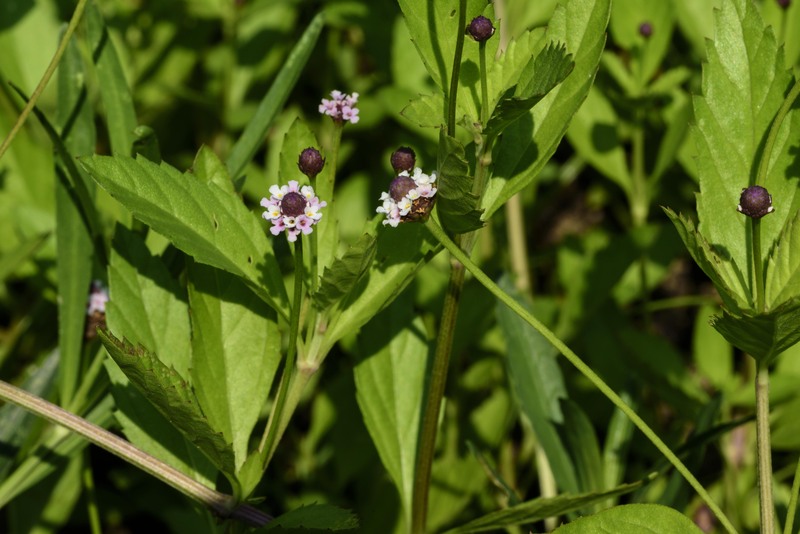 S. latifolia is in the Alismataceae, or water plantain family, which comprises anywhere from 80 to 120 species in about 15 genera, depending on which authority you consult. The Alismataceae is cosmopolitan, but most species are native to North America. 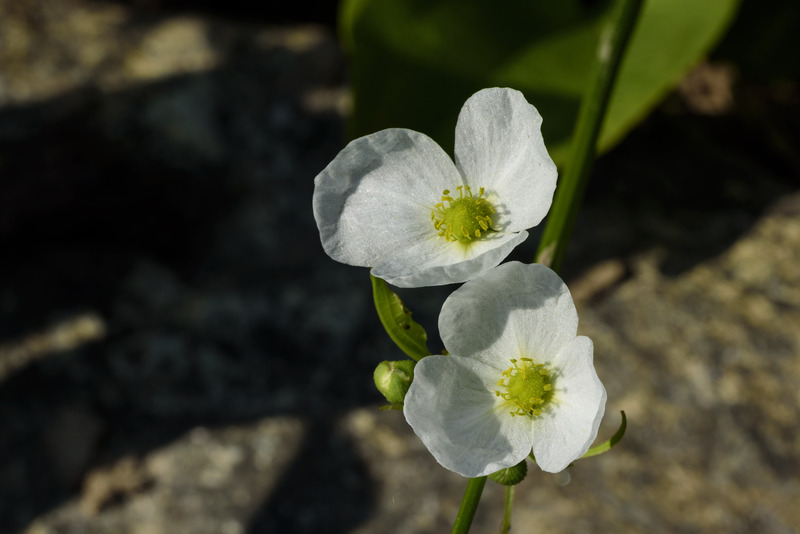 Common names include common arrowhead, wapato, wappata, and katniss. 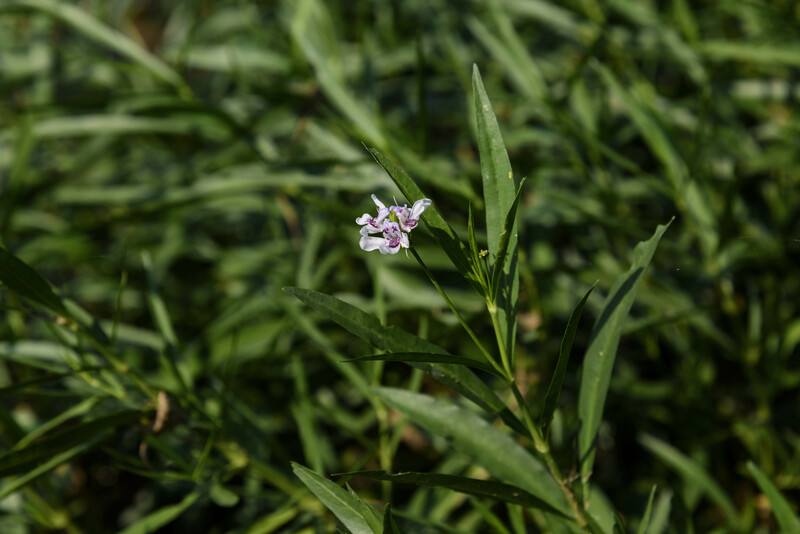 Some names refer to the plant’s appearance or habit: arrowleaf, bull-tongue, water-archer, water-lily, waxflower. Other names refer to edibility: Chinese-onion, duck-potato, muskrat-potato, swan-potato, swanroot, and tule potato. 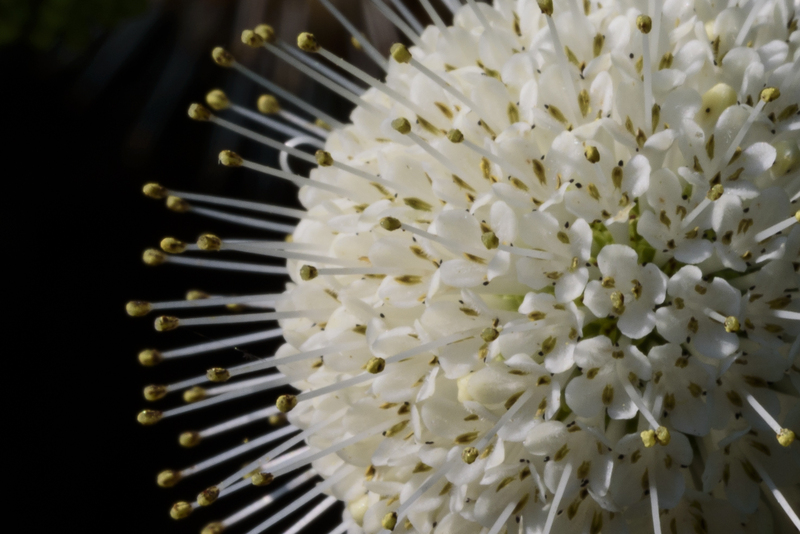 As soon as I finished shooting swamp candles Tuesday morning, I turned my attention to a nearby buttonbush. The sunlight was no longer quite so golden, but it was still making great shadow play among the plants. 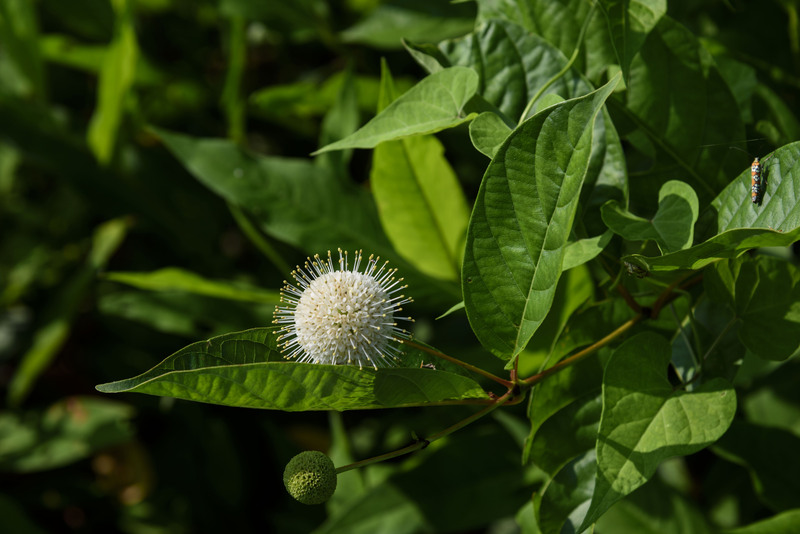 Cephalanthus occidentalis (Rubiaceae), also called buttonwillow, honeyball, and pond dogwood, ranges from Nova Scotia and Ontario south to Florida and Texas, and is also found in parts of Arizona and California. 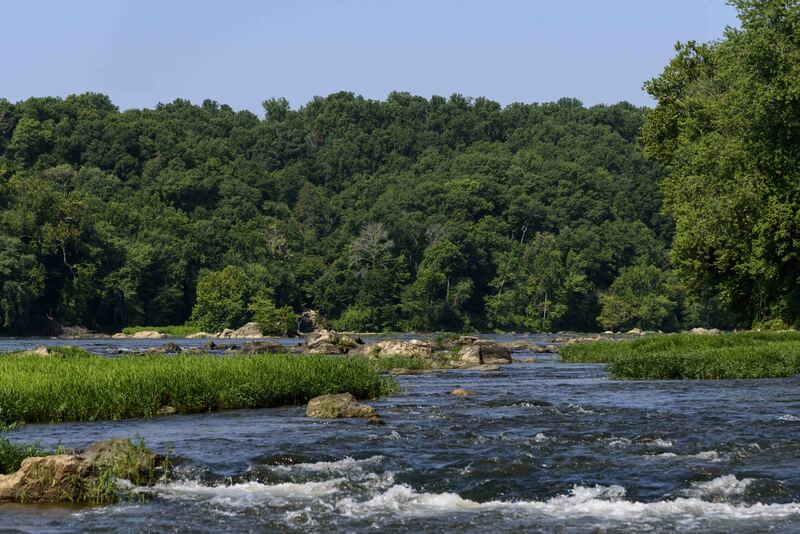 There are records of it in every Maryland county except Washington. 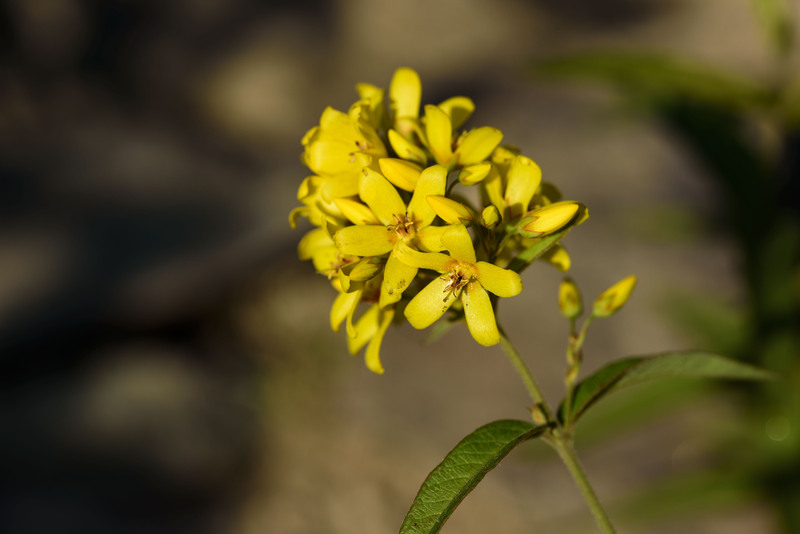 The multiple stems of this shrub can grow to about twelve feet tall, and the plant can be 6 feet across or more. 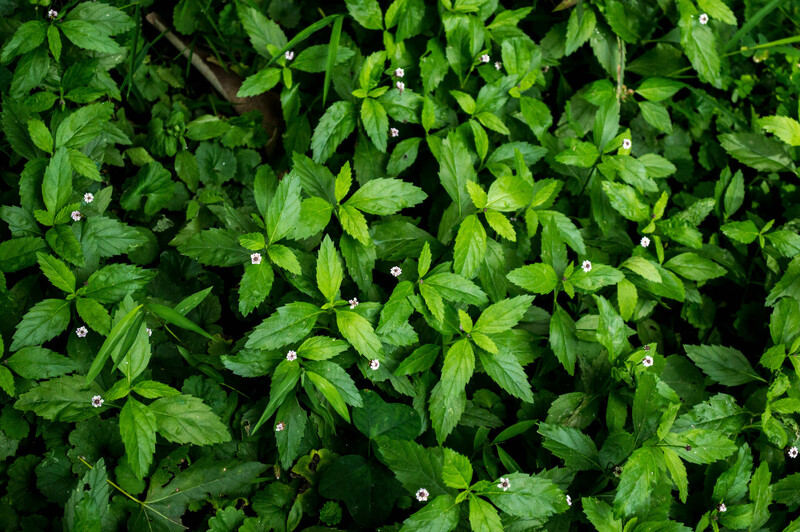 Foliage is dense and a pleasing shade of green, and how can you not love that inflorescence? 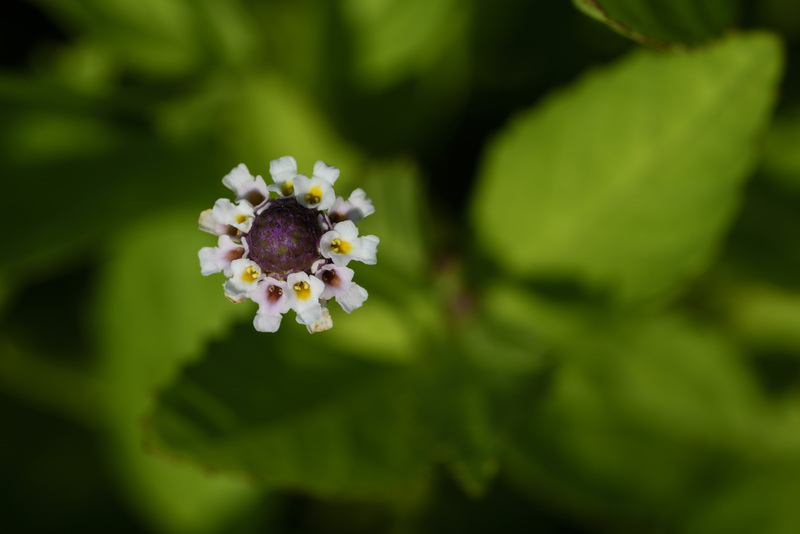 The flower heads measure about one inch across and bear dozens (hundreds?) 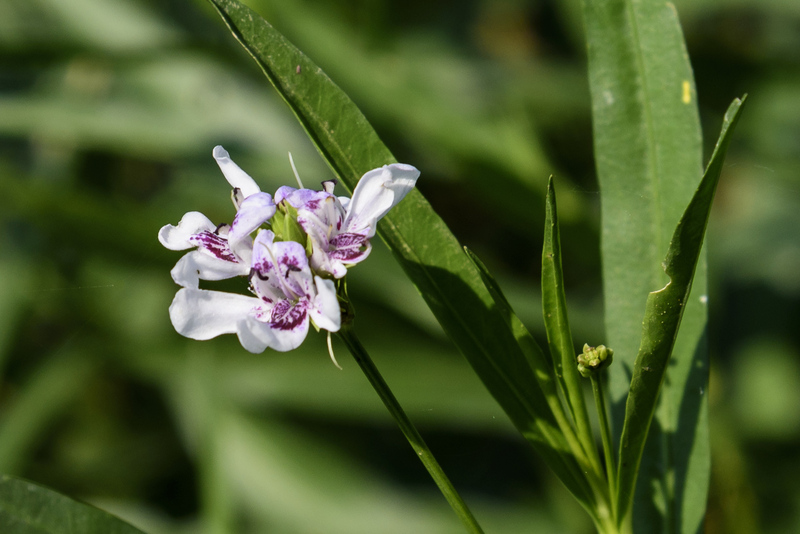 of flowers, each of which consists of four fused petals, four stamens, and one very long style. 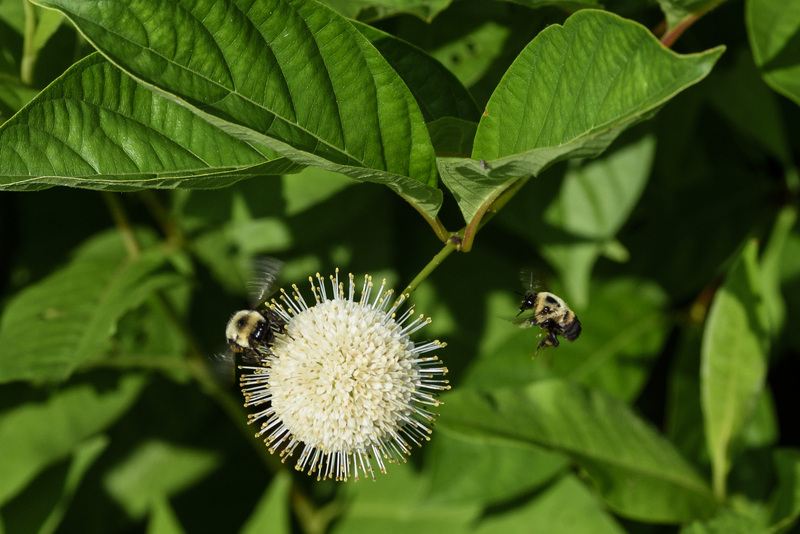 The flowers attract butterflies and bees, and later in the season the seeds attract birds. 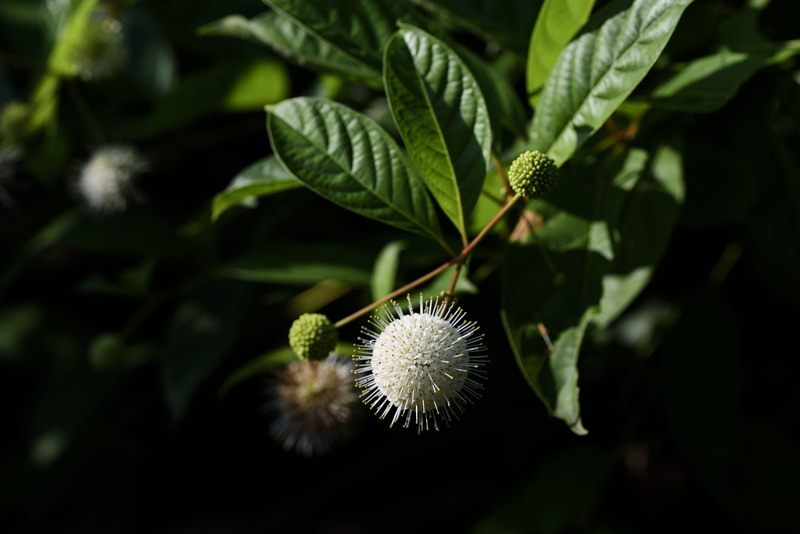 Buttonbush is a wetland obligate, meaning that in natural conditions it will be found in wetlands. But there are quite a few of them on the bedrock terrace, which is a dry place except for seasonal flooding and rains. There isn’t much soil there, and no groundwater. 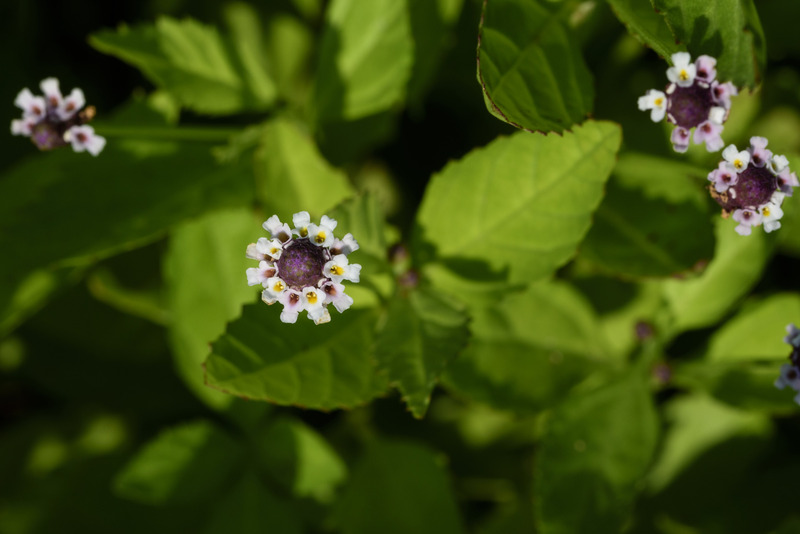 Knowing this, I had assumed it wouldn’t make a good garden plant, but I asked the question on a native plant discussion site and got a lot of encouraging replies. 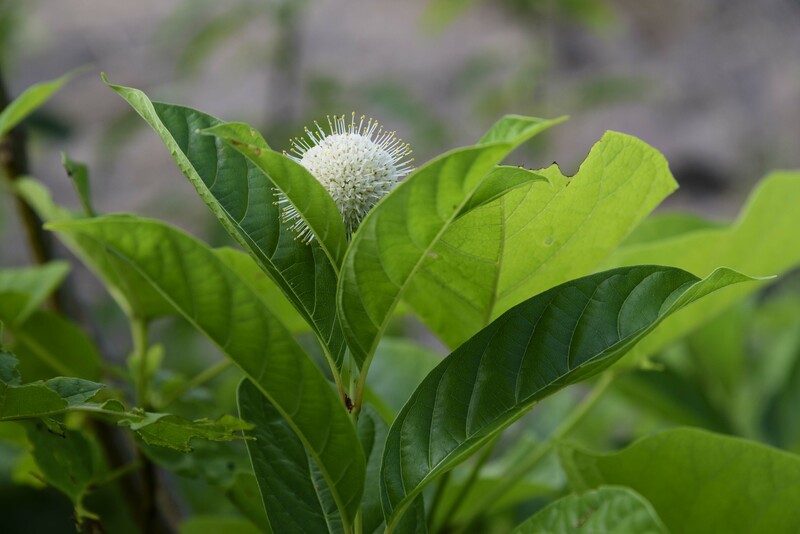 It seems that once established, buttonbush does quite well in drier soils. Hooray! Now I just have to find a place for one in my garden. On June 29, with my collecting permit about to expire, I went one more time to visit those two stands of irises near the Marsden Tract*, and collected two more seed capsules. Took ’em home, opened ’em up, photographed, measured, examined with hand lens, etc. And got nowhere. The seeds just weren’t ripe enough. My gut feeling is that stand 1 is Iris virginica and stand 2 is Iris versicolor, based on the observed characteristics. The former is on the state DNR watchlist (S3), and there are records of it in Montgomery County, so this is not too far-fetched. 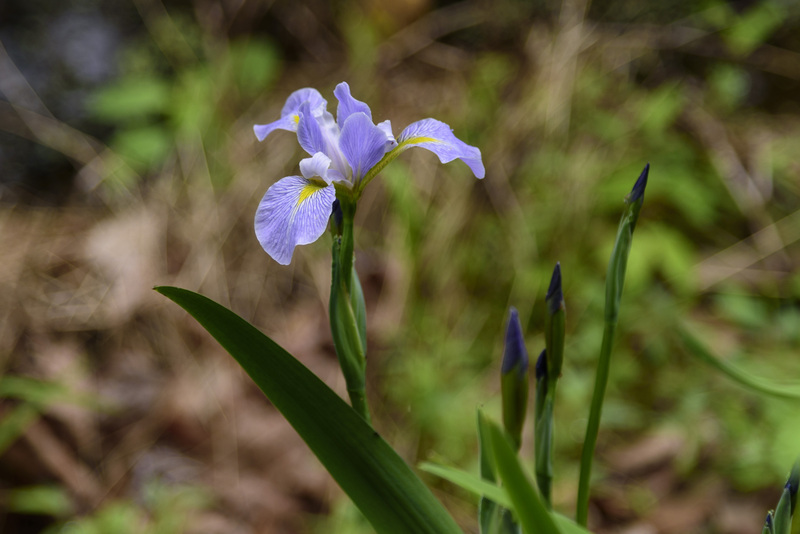 But I like proof, and I haven’t proven anything, except that I’m a little nuts, so I am going to conclude that both stands are probably Iris versicolor, because it’s the more common species. However… this ain’t over yet. Yes, I’m a book nerd: I bought reference books in a language I don’t read. You would not believe how much time I’ve spent trying to identify the flowers I found on my trip. In most cases genus is easily determined, but getting the species requires, well, specifics, many of which can be found in the three sources pictured here. Of course, I don’t read Faroese. I assumed I’d be able to use google translate to look for cognates in other Nordic languages, but that hasn’t worked so well. There are a few on-line translation services, but Faroese appears to have many noun cases, and I keep running across what I assume are declined nouns and conjugated verbs. And of course there’s botanical jargon. 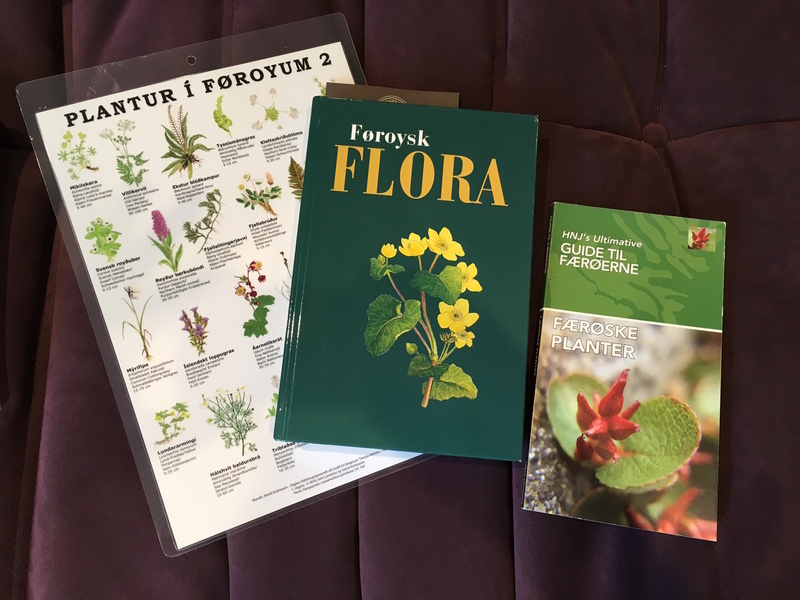 Hopefully now that I’m back I can use my English-language book of Icelandic flowers to solve some mysteries. We’ll see. 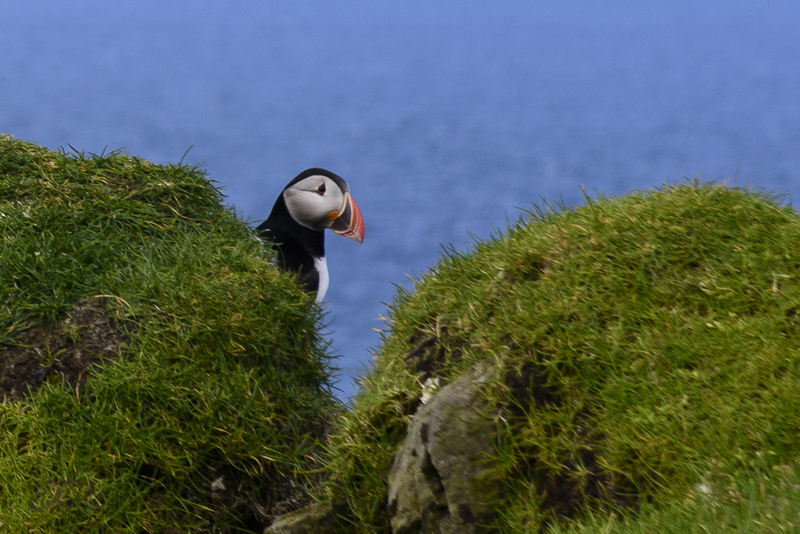 Expect scattered posts about the Faroe Islands in the coming months. In the meantime I’ve gotten out to the Billy Goat C trail twice. I was afraid I’d missed a lot, but nope: lots of great flowers to see if you look in the right places. 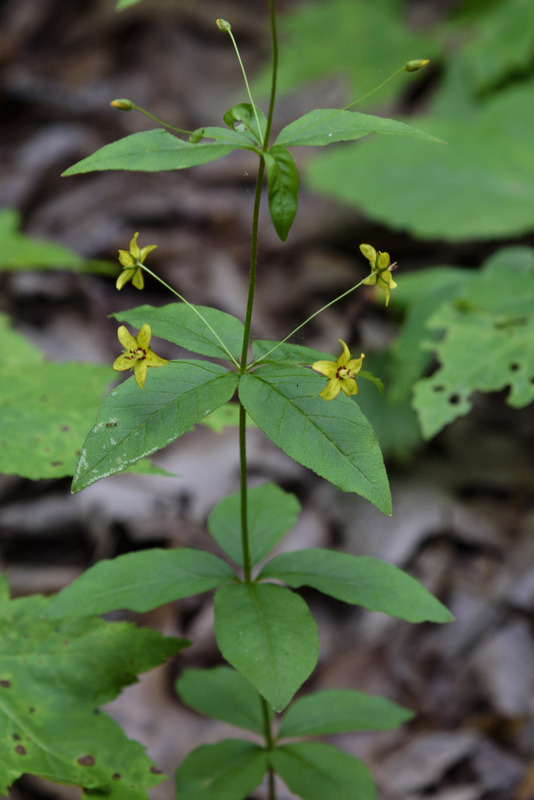 Now blooming in that area: nodding onion, swamp milkweed, buttonbush, swamp candles, fogfruit, monkeyflower, sea-oats, thin-leaved sunflower, grassleaf mudplantain, wild potato vine, common arrowhead, starry campion, horsenettle, American germander, culver’s root, jumpseed, various St. Johnsworts, St. Andrew’s cross, and water willow. Halberd-leaved rosemallow is budding up, and the joe-pye weeds are, too, and close to opening.